In November 1989 the Juvenile Court judge granted my former wife, Margaret, nee Pope, an unmonitored Christmas visitation with my three children, Andrea 8, Alexis 10, and Christian 12. She had been charged with physically abusing the boys, Alexis and Christian, and had been forbidden all contact with the children. On Christmas Eve, 1989, she arrived to pick up the 3 children for her court ordered visitation. She put Andrea in the car and drove off leaving the boys standing at the curb. We know that she immediately drove to LAX airport and boarded a plane for San Francisco. She and Andrea spent a few days in a women’s shelter in downtown San Francisco. Several months later a letter postmarked in Arlington, Texas was sent to Margaret’s mother in La Quinta, CA. There have been no other leads, and we have not seen, or heard from Andrea since that time. While we lack concrete evidence, the subsequent investigation revealed that Margaret presented herself as a victim of spousal abuse, and Andrea as a victim of sexual abuse. The shelter in San Francisco was for battered women fleeing abusive spouses. It was connected with one or more underground women’s groups providing shelter, false identities, and assistance to establish a new life. Margaret and Andrea have probably been living under false identities, with falsified school and work records, since there have been no contacts with school officials or past employers. Andrea is now a young adult, 22 years of age. She is of Hispanic origin (adopted in Costa Rica in 1983). Margaret is Caucasian, 53 years of age. If you have any information concerning Andrea’s whereabouts or condition, please contact the National Center for Missing and Exploited Children at 1-800-THE-LOST. They handle all communication in the strictest of confidence and you may remain anonymous. Andrea, we have been devastated by your disappearance. We miss sharing your life with ours, but it is not too late to reestablish a relationship and share our remaining years. You are a young woman living your own life and capable of making your own decisions. Certainly, whatever fears you were taught, are in the past and unable to harm you now. Your blood brothers, Christian and Alexis, were traumatized by your abduction. They had some very troubled years following your disappearance. I have done my best to help them through this. Vicki has done everything, and more, than any stepmother could do for them. Yes, Vicki and I did get married in 1990, and this year we celebrate our 14th anniversary. Christian and Alexis, now 27 and 25, have moved back to their home country of Costa Rica, and are establishing their own lives. They share an apartment together but are pursuing separate careers. When I talk to them, the first thing they always ask is about you. Have I heard from you? Have I learned anything about where you are, or how you are doing? They desperately want you to be a part of their lives, and by every right in the world you should be. You are a part of them, and they a part of you. Neither your life, nor theirs, is complete as long as you are separate. If you are hesitant to contact me directly, you can call the National Center for Missing and Exploited Children at 1-800-THE-LOST, and send a message through them. They will protect your identity and location until you decide to disclose it. Please get a message to your brothers. They need to know that you are all right. And get a message to me also; I need to know that you are OK.
I’ll love you always, Dad. Andrea's photo is shown age-progressed to 17 years old. 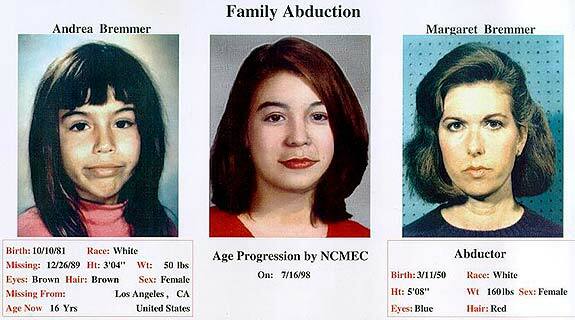 She was abducted by her non-custodial mother, Margaret Bremmer. A felon warrant was issued for her abductor on August 6th,1990. the child has a scar on her right elbow and one under her chin.